Every city requires a rapid transport system that can provide a fast, convenient, and reliable public transport, including “last mile” connectivity. Chennai metropolis has been growing rapidly and traffic volumes on the road have increased enormously. Need was felt of an underground rail-based system that can integrate with other existing transport systems, both rail and road. Two routes were planned: Corridor 1 of 23 km starting from Washermanpet to Airport, 14.3 km of this would be underground. 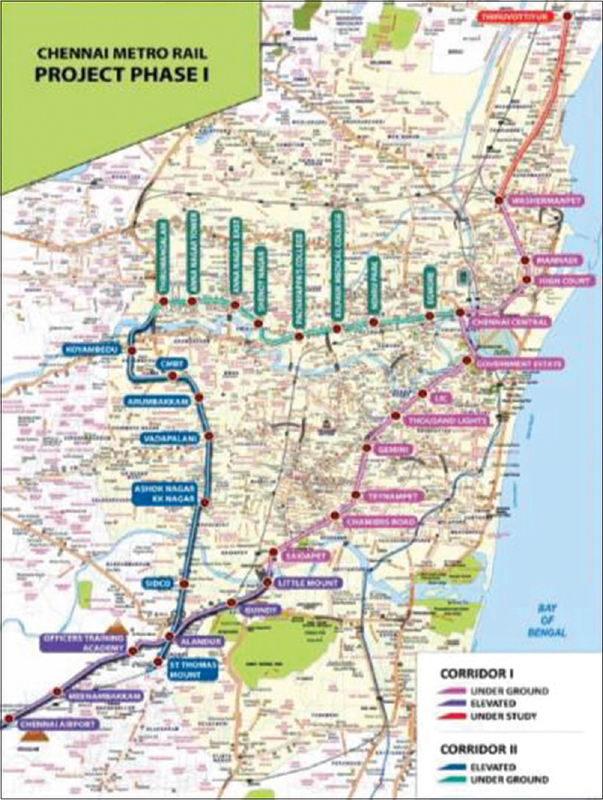 Corridor 2 of 22 km starting from Chennai Central Railway station to St. Thomas Mount, 9.7 km of this would be underground. Central station would be of two tiers and a junction point [Figure 1]. 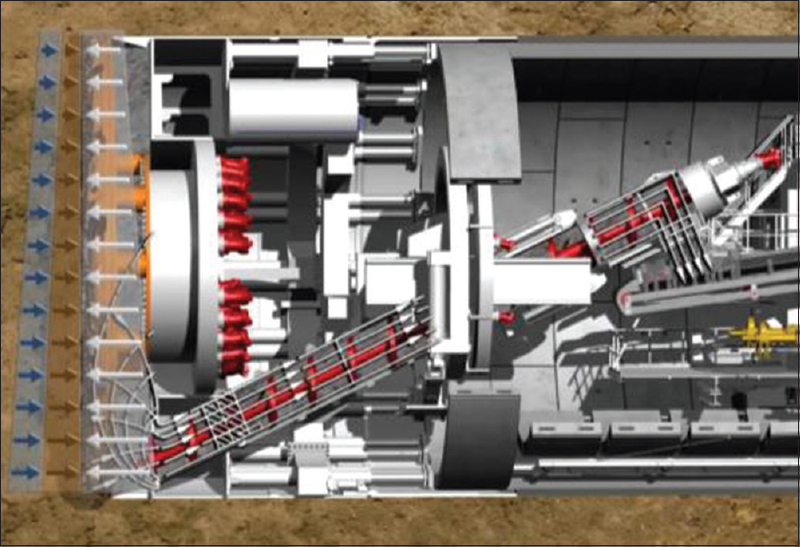 New generation of Earth Pressure Balancing-Tunnel Boring Machines (EPB-TBM) were selected for use [Figure 2]. Deep trenches of 20–22 m were dug and a total of 12 TBM lowered for use. Boring, excavation, transportation of muck out of tunnel, and lining of the tunnel using prefabricated segments are done by one machine itself. Prefabricated interlocking segments are used for lining with the help of an erector, which is a part of the TBM. Tunnel is thus a tube made by a number of segments joined together. Depending on soil and ground water conditions, different means are used for stabilizing the tunnel face. Compressed air face support is one of them and most effective one but expensive. In the early days, a gang of workers would be deployed in compressed air to excavate and build a tunnel. This is now done by the TBM. Cutting tools fitted at the face of the TBM need maintenance and/or replacement. A team of miners then enter the working chamber through man locks fitted on the TBM. Man locks are operated by experienced operators till completion of work. These hyperbaric interventions normally last for a short duration of up to a week or longer depending on damage sustained to cutting tools. Competent manpower and equipment is required to support the operations. Many safety parameters need to be met and are stringent. Although the technique is over a century old, compressed air working (CAW) has not been used extensively in India. Caisson sinking during bridge and port development have been the only construction sites where CAW has been used in the past. In caisson sinking or in old conventional pressurized tunnel construction, a large number of workers toiled in compressed air. On a TBM, one team consists of three persons who work in compressed air for up to 8 h depending on pressure used. They would be relieved by another team and first team decompressed to surface by the man lock operators. Assessment of fitness to work in compressed air was the first task. Volunteers were requested for among the engineers and other workers, both technical and nontechnical. Every individual required a thorough physical examination along with a number of investigations which consisted of chest X-ray, X-ray of long bones and joints, spirometry, audiometry, resting ECG and exercise test, and a complete blood count along with random blood glucose estimation. Individuals with deviated nasal septum (DNS), chronic asthma and other lung pathology, history of middle ear infections were rejected. On completion of medical examination, successful candidates were subjected to a pressure test to 1.8 bar for 10 min in the therapeutic chamber (medical lock). Prior to pressure test, they were taught Valseva maneuver. Pressurization was done very gradually over 5 min for them to practice and learn Valseva maneuver effectively. Those who could not inflate middle ear on increasing pressure or were psychologically unsuitable for to be under pressure were rejected. Psychological aspects play an important role in compressed air. An experienced attendant accompanies the workers and observes their behavior. Confined space, heat, noise, and the fact that unless proper decompression is carried out, he cannot get out of the man lock are main causes of claustrophobia. On the flip side, extra salary or pressure bonus is a major motivating factor. Fitness to work was re-assessed every 3 months and a repeat thorough examination was done annually. Electric compressors were used to supply air and a sample was obtained from every compressor and analyzed for purity. Indian standards for “Breathing air quality,” IS 15879 (2002), was used as benchmark for air purity. Subsequently, air quality was monitored by safety personnel once during every shift using hand-held multigas monitors. Oil vapor and oxides of nitrogen from diesel compressor is a major health hazard. In this project, only electric compressors were used. Diesel compressor was used as a standby. Filters were incorporated on the air line as an additional safety. Pressure gauges used need to be accurate and are to be calibrated every 6 months. In addition, a 24-h pressure recorder is fitted on the man lock. When pressure reading in two gauges differs by 0.05 bar, they need to be re-calibrated or replaced. Barotrauma: Change in surrounding pressure causes direct damage to air containing cavities in the body directly connected with the surrounding atmosphere, principally ear, sinuses, and lung. Decompression sickness (DCS): This predominantly occurs as pain around joints, or rarely as a serious, potentially life-threatening condition, which may affect the central nervous system, heart, or lungs. Dysbaric osteonecrosis: This is a long-term chronic condition damaging the long bone joints, hip, and shoulder. Barotrauma affects air-filled cavities in sinuses, middle ear or in severe cases, lungs. Inability to equalize pressure in these spaces with increased ambient pressure due to blockage of Eustachian tube More Details by cold is the main cause of barotrauma. DNS is a predisposing cause. Chronic bronchitis, asthma, breath holding while surfacing often leads to pulmonary over pressure syndrome. Stringent preemployment medical examination is able to prevent these conditions. Conventionally, decompression of a tunnel worker simply meant opening a valve and letting the air out till the pressure equalized with atmospheric pressure. When it was realized that DCS is caused by rapid decompression, the valve was opened by fewer turns and slow decompression was provided. Haldane, on physiological principles and experimentation, had postulated staged decompression in 1908 based on the Royal Navy. Other navies followed suit. Caisson industry remained traditional. In 1966, Hempleman devised new decompression tables which were first used at Blackpool in UK and came to be known by that name to-date. These are the industry standards for decompression unless national standards exist. As far as the miners were concerned, getting “bends” was considered as an occupational hazard and also the fact that often the joint pain reduced when the worker was compressed for the next shift! Therapeutic recompression! “Air pain” or “niggles” is the most common phrase used to describe this. Breathing oxygen during decompression was found to be beneficial in prevention of decompression sickness in diving, but the tradition-bound tunneling industry found it both “costly and dangerous.” Fingers were pointed at an accident in Japan wherein six miners died in an explosion while undergoing oxygen decompression. Reason for explosion is one of the workers lit a cigarette! France and Germany started using oxygen decompression with marked reduction in incidence of DCS. British, most conservative, gave approval in 2001 for using oxygen during decompression at 6, 4, and 2 m. Choice is left to the contractor. Indian Standard IS: 4138-1977 does not address oxygen decompression. Post decompression, oxygen breathing for half an hour is recommended with some benefits in preventing DCS. It has been consistently noted that workers acclimatize to the compressed air environment and become less prone to DCS after 7 to 10 days of daily exposure. After a 2-week break acclimatization is lost. Incidence of DCS is higher during the first week of work. Long-term effects of CAW: Inadequate decompression especially at pressures beyond 2 bar are known to produce central nervous system damage with noticeable EEG changes. Opacities on magnetic resonance imaging have been observed among caisson workers who have not suffered from DCS. Osteonecrosis: Dysbaric osteonecrosis is a long term, chronic condition damaging the long bones, hip, or shoulder joints. British Tunneling Society therefore recommends that compression and decompression records of miners be preserved for 40 years. Depository exists in UK to keep individual health records in electronic form. Collapse of tunnel face and loss of pressure. 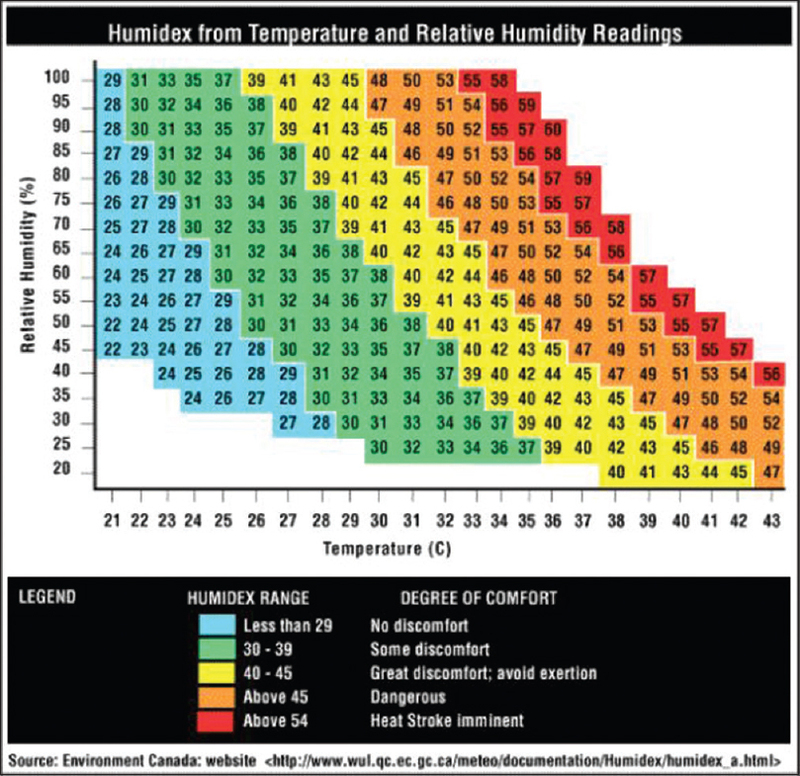 Temperature and humidity: High temperature and humidity was a challenge to working. Dry and wet bulb thermometers are used in man locks. Humidex  table was a guiding factor. However, dangerous zone was often crossed [Figure 3]. Increased ventilation and use of oral rehydration fluids were used extensively. Reduction in working hours in compressed air helped reduce the incidences of heat exhaustion. Putting blocks of ice in working chamber prior to starting work reduces the temperature. Chilling the air that is being supplied to working chamber is the only safeguard. During mining and ring building, the noise levels as recorded are above 110 dB. TBM operator is well protected in a sound-proof cabin and all other persons are more than 100 m away. They are provided with ear plugs. Collapse of tunnel and water inundation, which happened often during conventional tunneling, will not happen in tunnels built with prefabricated segment. Collapse may occur at face due to sudden loss of air and sink hole formation. Miners working at the cutter head need to be evacuated in the man lock and bulk head door secured. Vigilant lock operator will be able to handle this with ease. Remedial measures can then be carried out. More than 35,000 man hours of work has been done under pressures varying from 1.2 to 1.95 bar. There were only three cases of pain only (Type I) DCS, which were treated with recompression. Lock operations by experienced operators, efficient supervision, and reduced working hours under pressure have been the reasons for this low incidence. Compressed air working can be undertaken only up to 3.5 bar. Beyond this pressure, nitrogen has narcotic effect on a person and his actions are unpredictable. Nitrogen partial pressure in breathing mixture needs to be reduced by replacing it with another inert gas helium to produce “trimix” – N2HeO2 mixture. This was used extensively in offshore oil industry during its early phase, before advent of “saturation diving” methods. The oil industry has demonstrated that a diver can work at depths up to 250 m provided stringent safety parameters and work methods are used. Using this, a tunnel has been constructed under Bosphorus channel in Turkey where pressure of 11 bar was encountered. Occupational health is rarely addressed by the employers. Employees often keep quiet because of fear of reprisal by the employer. Health at work and healthy work environment are among the most valuable assets of individual, industries, communities, and countries. National Health Policy (NHP-2002) has highlighted the fact that the “work conditions in several sectors of employment in the country are substandard. As a result, workers engaged in such employment become particularly vulnerable to occupation linked ailment.” Concern for safety in most cases is brushed under the carpet as the safety implantation is expensive! Safety improvement initiative gets implemented only when forced to do so by the client. Working groups of British Tunneling Society and International Tunneling Underground Space Association  have produced a number of guiding documents for compressed air work and they should be used to formulate a policy of safe working practices at every site. There is thus an urgent need to update Indian Standard 4138-1977: Safety Code for Working in Compressed Air, which can be enforced legally and supersedes every other guidelines used by the industry. As more and more tunneling projects are being considered, newer challenges will evolve and will have to be addressed. British Tunnelling Society Compressed Air Working Group, A guide to the work in compressed air regulations; 1996. Kindwall EP. Compressed air tunneling and caisson work decompression procedures development, problems, and solutions. Undersea Hyper Med 1997;24:337-45. Ichiro Nashimoto in Proceedings, first International Arthur – Bornstein – workshop on medical aspects of deep tunnelling and diving – the 49 workshop of the undersea and Hyperbaric Medical Society. Safety code for working in compressed air Indian Standard IS 4138-1977. Rozashegyi I. Neurological damage following decompression. In: McCallum RI, ed. Decompression of compressed air worker in civil engineering. Newcastle-upon-Tyne: Oriel Press; 1967. Fueredi GA, Czarnecki DJ, Kindwall EP. MR findings in the brains of compressed air tunnel workers: Relationship to psychometric result. Am J Neuroradiol 1991;12:67-70. Sealey JL. Aseptic bone necrosis survey in compressed air workers. J Occup Med 1975;17:666-7. Source: www.aerochapter.com/notes. [Last accessed on 2018 Jan 10]. National health policy 2002, Ministry of health and family welfare, Govt. of India. Guidelines for good working practice in high pressure compressed air, ITA working group no. 5, International Tunnelling Association. CH 1015, Lausanne.